Leesville Road superstar Timara Chapman claimed the North Carolina Heptathlon State Record on Saturday in a runner-up All-American performance at New Balance Outdoor Nationals. Chapman scored 5014 points becoming the states first Heptathlete to exceed 5000 points with standard Heptathlon scoring. The record stood since 1984 when Teri LeBlanc scored 4953 points. At the time LeBlanc scored 5124 points, but scoring tables were updated in the 1990s and her performance is converted to 4953 on today's scale. The Heptathlon is a grind. On day one athletes compete in the 100m Hurdles, High Jump, Shot Put and 200m Dash. Then the following morning athletes compete in the Long Jump, Javelin and 800m Run. Last year Chapman made her Heptathlon debut at the National meet where she scored 4328 points earning a 6th place All-American finish. 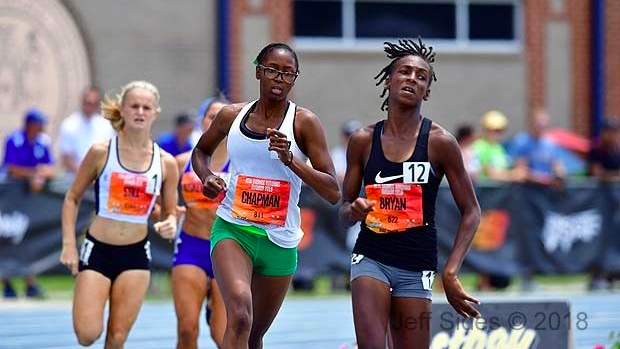 Over the course of the summer, Chapman improved to 4724 points at the USATF JO National Championships where she earned 17-18 Age Group Runner-Up. After day one Chapman sat in third overall less than 100 points outside of the leader Beatrice Juskeviciute (IMG Academy, FL). Chapman's highlights of the day were a PR in the High Jump of 5-6, second best out of the field and a 24.98 200m Dash, scoring 889 points which was the best of the entire field. Chapman would also run 14.92 for the 100m Hurdles and threw 30-7.75 in the Shot Put. On day 2 Chapman jumped 16-9.25 in the Long Jump, where she was hoping for more with a season-best of 17-5 from the 4A State Championships. She was able to bounce back with a big PR in the Javelin where she threw 109-5, the third best amongst the field and a 25 foot PR. At nationals last year Chapman threw 56-9 in the Javelin. Chapman moved into second with a slight advantage on Suenomi Norinh (MI). Chapman was an 800m runner before she became a Heptathlete. Chapman clocked a runner-up finish in the 800 running a season best of 2:19.65 locking up her second-place finish. The will close out Chapman's high school career who has had a ton of success in just two years and 5 attempts in the Heptathlon. Chapman will head to NC State in the fall where she'll continue her career in the multi-events. Hillside junior Jada Green took 8th overall in the event with a total of 4526 points. If Green can have a similar improvement to Chapman in the event over her senior year we could see her challenge her State Record at this time next season.